To the rescue: Will SLO County officials go 'all in' on groundwater? On an afternoon in mid-January, San Luis Obispo County 5th District Supervisor Debbie Arnold called up New Times to ask if she could drop off a document. 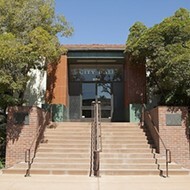 It was a copy of an article from the Golden Gate University Environmental Law Journal, co-authored by attorneys Adam Keats and Chelsea Tu in January 2016. In the piece—“Not All Water Stored Underground is Groundwater: Aquifer Privatization and California’s Groundwater Sustainability Act”—Keats and Tu sounded an alarm for SLO County: Creating one water district over the Paso Robles Groundwater Basin, which was under consideration at the time, could open the door for wealthy agribusiness investors to turn the aquifer into a water bank. A district with basinwide powers, controlled predominantly by big landowners, Keats and Tu argued, set the stage for profit-chasers to bank, pump, and sell water. 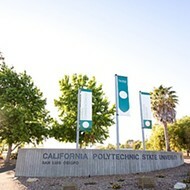 The authors likened it to agribusiness tycoon (and Justin Vineyards owner) Stewart Resnick gaining control of the Kern County Water Bank in the 1990s—an acquisition that Keats is currently trying to reverse through an active court case. Through alleged secret deals, Resnick’s Paramount Farms established a right to the Kern Water Bank. The bank (basically, an underground aquifer) received cheap water from the State Water Project that allowed Resnick to both irrigate his farms and sell water at will. Despite repeated denials about a similar agenda for the Paso basin from district stakeholders like Matt Turrentine and James Ontiveros, who oversee Harvard Investment Group-owned vineyards in Shandon, many residents over the basin share Arnold’s suspicions about the district. One year after North County voters resoundingly rejected that water district, the aftertaste of resentment and distrust still permeates the politics over the water basin. “It’s demoralizing,” said Dana Merrill, owner of Mesa Vineyard Management in Templeton and an early proponent of forming a water district. The latest twist in the Paso groundwater story occurred at a SLO County Board of Supervisors meeting on March 7, when it appeared that supervisors committed a Brown Act violation while making major changes to the county’s groundwater strategy. 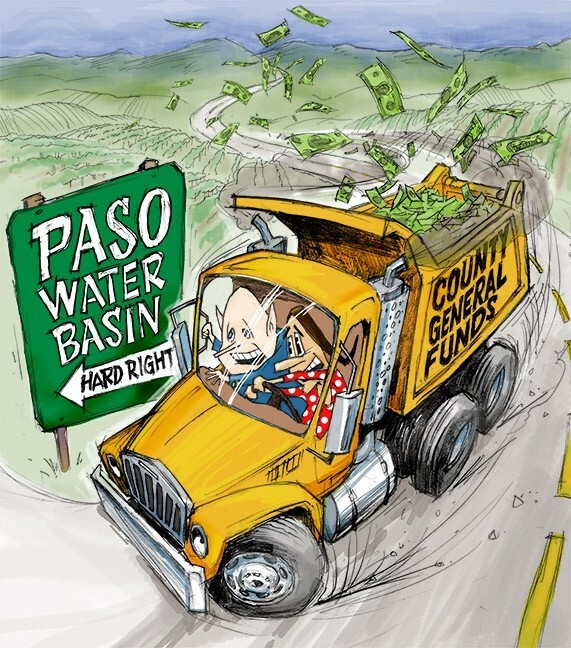 The move exacerbated the tensions already surrounding water politics and set up a countywide debate: Should county taxpayers have to pay for groundwater management of individual basins such as Paso’s? The Paso Robles water basin is a 790-square-mile aquifer serving thousands of North County residents and hundreds of thousands of acres of crops. 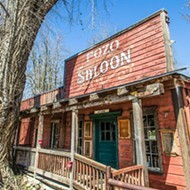 In 2013, several residents’ wells dried up over the basin. The Board of Supervisors enacted a moratorium on new irrigated agriculture over the basin that’s still in place today. It’s one of five basins in the county that are subject to the Sustainable Groundwater Management Act (SGMA), a state law passed in 2014 mandating management of depleted basins statewide. SGMA calls for water basin users to form Groundwater Sustainability Agencies (GSAs) by June 2017 and for those GSAs to write basin sustainability plans by 2020. If local stakeholders don’t (or can’t), the state will step in and do it for them. HARVARD GRAPES: The Harvard Investment Group purchased thousands of acres of land in SLO and Santa Barbara counties in 2012. 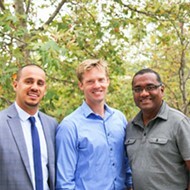 Matt Turrentine and James Ontiveros of Grapevine Capital Partners manage the land and Turrentine is up for a board position for the new Shandon-San Juan Water District. Residents over the Cuyama Valley Groundwater Basin have already formed a water district to participate in a GSA with local agencies, the Los Osos and Santa Maria River Valley groundwater basins are mostly subject to court-ordered management, and the city of SLO is stepping up to help manage the San Luis Obispo Valley Groundwater Basin. But the final call of who will participate in a Paso basin GSA is still uncertain. “We’re the latest people and the stupidest people in the whole process,” Merrill lamented. SLO County is running awfully close to the June deadline, with some areas of the aforementioned basins still not represented by a GSA. 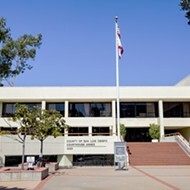 The county’s in danger of missing the boat if the Board of Supervisors commits another blunder like it did on March 7. During a SGMA update at its March 7 meeting, a majority of the board decided to revise the county’s water strategy. 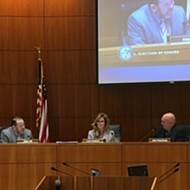 Supervisors Arnold, John Peschong (1st District, which falls over part of the Paso basin), and Lynn Compton (4th District, which falls over part of the Santa Maria basin) voted to establish the county as the groundwater management agency for all the areas of any basin not already covered by a GSA—at no extra cost to those landowners. In short, over the next three to five years, the board decided that the county should spend an estimated $6.1 million to cover the costs of establishing a GSA and building management plans for all or parts of those five separate water basins. Before that vote, the established policy was that the county would be willing to serve as a GSA—but only if basin pumpers were willing to pay for their share of the costs through approving a property tax increase. Neither county staff nor the public appeared prepared for the board’s proposal, since no policy change was on that meeting’s agenda. 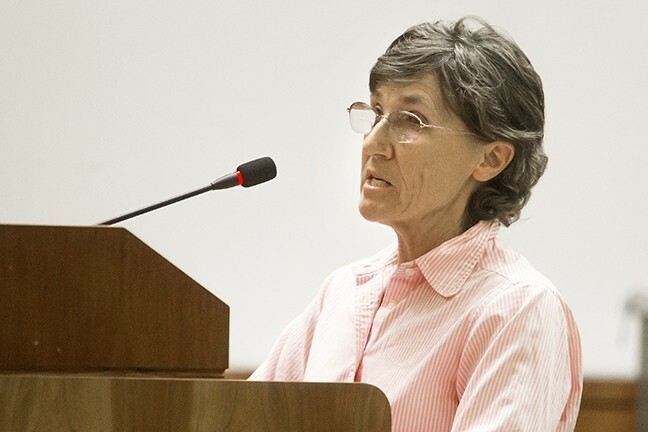 Laurie Gage, a rural Paso Robles landowner, promptly filed a Brown Act complaint with the County Counsel’s Office on March 8. After a tongue-lashing from the public on March 21 and strong advice from county staff to re-agendize the item, the board decided to hold a public hearing on the policy change at its April 4 meeting. While the supervisors’ decision hangs in the balance, residents throughout SLO County are still grappling with its implications. How much is $6.1 million to SLO County’s coffers? In Arnold’s eyes, it’s not that much when you compare it to the county’s nearly $600 million annual budget. Arnold believes that, in this context, spending money on groundwater management is a worthwhile investment. “In my mind, this is the perfect role for county government,” Arnold said. The funding would come out of the county’s Flood Control District, which operates from about $2.5 million in revenue per year in countywide property taxes. County officials say the Flood Control District doesn’t contain nearly enough money to pay for everything the Board of Supervisors indicated on March 7. 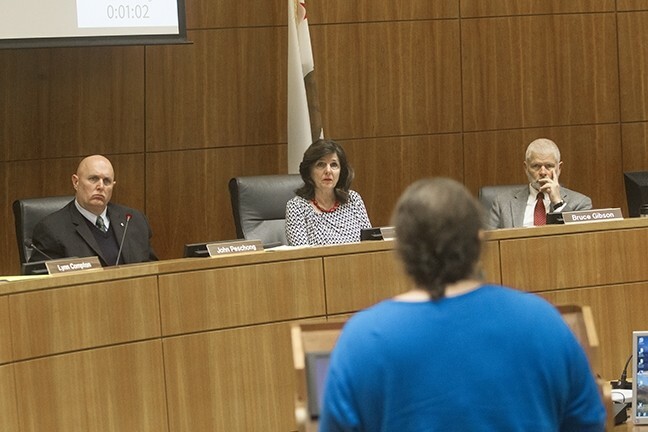 AGENDIZED: Rural Paso Robles resident Laurie Gage brought a Brown Act complaint against the SLO County Board of Supervisors after it changed the county’s groundwater policy on March 7 without public comment. The decision will be revisited on April 4. That bothers 2nd District Supervisor Bruce Gibson (Los Osos basin), because it means countywide taxpayers would be paying for other people’s groundwater management—at the substitution of another need or project. Looking at the numbers a different way, estimates are that only $6 million will be available to the county for discretionary spending in 2017-2018. Supervisor Adam Hill (3rd District, San Luis basin), who also voted against the March 7 proposal and described the vote as an “unprecedented money grab,” focused on the question of fairness. “If you live in a city or an adjudication basin, and you pay increased [water] rates, the question you should have is, ‘Why are you taking my money to subsidize these other towns’ compliance with groundwater?’” Hill said. Supervisor Compton sided with Arnold, pointing out the steep costs that the county could place on some sparsely populated basin overliers—in Los Osos, for instance—who’d be strapped with many thousands of dollars in increased property taxes to pay for the costs of complying with SGMA. Compton, Peschong, and Arnold ultimately felt that the $6.1 million to cover the unrepresented owners over five basins is something the county could reasonably take responsibility for. It is also a quick fix to avoid state management. “As I met with voters in my community, none of them wanted the state to take [the water basins] over,” Peschong said. The supervisors’ March 7 vote felt like a gut punch for Paso basin landowners trying to form and finance two new water districts (which are also GSAs) to represent themselves in coming up with a basinwide groundwater management plan. “They pulled that out of a hat,” Sinton said. Sinton, owner of Shell Creek Vineyards, is one of the leaders of the Shandon-San Juan Water District, approved by the SLO County Local Agency Formation Commission (LAFCO) in October. 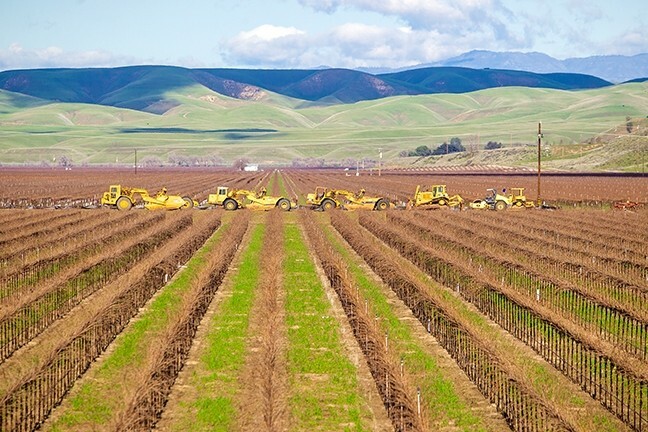 That district includes property purchased and developed into vineyards by Brodiaea Inc., a branch of the Harvard Investment Group. Shandon-San Juan will hold an election for its funding and board members on April 11. Merrill is the chair of a committee to establish an Estrella-El Pomar-Creston Water District. The LAFCO hearing to consider forming that district is on April 6. Both districts are an opt-in, voluntary format and were spearheaded by property owners who were in favor of the first attempt to form one large district for the Paso basin. Merrill said about 170 landowners have joined the Estrella-El Pomar district while about 60 landowners, with larger parcels, have joined the Shandon-San Juan district—altogether accounting for roughly 50 percent of the total water demand in the basin. The two water districts, if established, would serve as separate GSAs for the Paso basin, along with the county, the city of Paso Robles, the San Miguel CSD, and the tiny Heritage Ranch CSD. WATER POLITICS : Pictured left to right, SLO County supervisors Debbie Arnold, John Peschong, and Bruce Gibson listen to public comments about the county’s water policies on March 21. Together, the districts offer a significant financial boost to the SGMA effort, which is why the county Board of Supervisors’ action came across as a slight. What Sinton’s suggesting is: What if the two water districts folded and the Paso basin lost that funding? Would the county still be willing to pick up the tab? Wade Horton, the SLO County public works director, said he doesn’t think the members of the proposed Paso water districts will play that game, because they ultimately want a seat at the table in crafting the sustainability plan that will chart the basin’s future. Basin overliers like Myhre, who were philosophically opposed to the water district over the past four years, were glad the county showed an interest in representing them. “What a wonderful surprise,” she said. Merrill said he’s tired of defending himself and others against speculation and accusations about schemes like water banking. But he’s equally tired of seeing nothing happen to replenish the Paso Robles basin. Since last summer, the Paso basin GSA stakeholders have been meeting regularly to hash out basin management details like potential cost-sharing models, projects, and budgets. In the end, each groundwater basin that’s subject to SGMA can only have a single sustainability plan written by 2020, so for a basin like Paso, with six GSAs, they’ll all have to work together. The water districts and the city of Paso will look to implement potentially expensive basin recharge projects, like utilizing recycled water from Paso, which is a few years away from becoming available; buying a slice of Lake Nacimiento water; and exploring closing the gates on the Salinas Dam, which could double the capacity of Santa Margarita Lake. Conservation is an approach that the county is more inclined to advocate for, although its last attempt at that with the irrigation moratorium wasn’t completely effective. More than 2,381 acres of new crops were allowed to be planted after the ordinance took effect under an exemption of having a “vested right or interest,” according to county data. Nevertheless, conservation as a basin management strategy is what Supervisor Arnold’s interested in more than costly recharge projects. Arnold calls the county the “neutral party” in SGMA. One of the county’s stated goals is to make sure basin plans are complying with county laws, like the ordinance regulating water banking. “The county needs to keep an eye on all the basins,” Arnold said.